Rose does not know where this cat came from, but she suspects he may have been abandoned by some renters in the apartment complex nearby. Whatever the case, he found a kindhearted person in Rose and decided to adopt her. 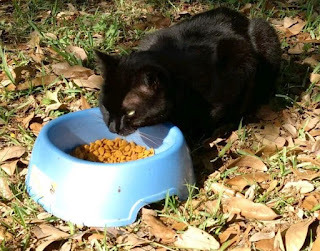 Rose named him Coal for his all-black coat and began to care for him and care about him. So when Coal did not show up at his usual meal time, she became concerned. Meanwhile, nearby neighbors, John and Cathy, discovered a black cat stuck in a tree in their backyard. 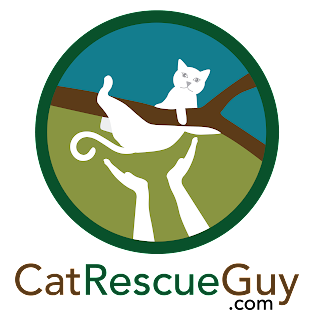 Being caring people, they went through the painful process of trying to find someone to get the cat down before they found a veterinarian who recommended me. They also connected with Rose so that they could coordinate their efforts to help this kitty. I arrived there the next morning and met John, Cathy and Rose. They led me to the tree where Coal was stuck. He was perched about 20 feet high where the trunk split into two stems. While Coal spoke to us from above, Rose told me that he is a reasonably sociable boy but is also skittish and easily frightened by loud sounds. I hoped that I could climb up to him gently and quietly enough to keep him from climbing higher in the tree. Coal handled the setup process just fine, and when I began to climb up to him, he remained calm and in place. Once I was close enough, I reached out my hand for him to sniff, and he did so with no reaction. I went up a little higher, and he let me touch him. Rose told me that he sometimes swats at her if she touches him in not-the-quite-perfect way, but generally is find with pets on the head. I stroked his cheeks and petted his head and got nothing but a positive reaction from him, so I was feeling good and ready to bring him down. I decided to cement our new friendship with some food, so I opened a can for him. He was mildly interested and took a few licks, but, otherwise, was not that impressed. I put the food in the back of the carrier and held it up to him, but he was rather indifferent about it and would not go inside. I put the carrier away and was about to prepare the cat bag, when something happened that may have spooked him. I don't know what it was. Maybe I made a loud or unexpected noise, or maybe I moved in just the wrong way. 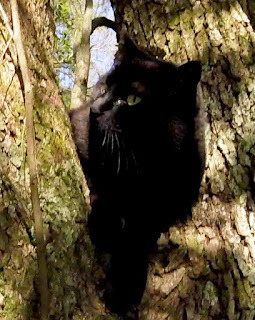 Whatever it was, he began to back up and quickly found himself hanging vertically on the side of the trunk of the tree in the perfect position for climbing down. His face seemed to show both the terror of finding himself in this position and the surprising realization that he might be able to go down this way. With one paw at a time, he gradually inched his way down and began to pick up his pace as he felt more confident with his new-found ability. He climbed all the way down the tree until he got to a fork in the trunk, and from that point, he made a short jump to the ground. He wandered off into the brush where we all lost sight of him, but we were confident that he would make his way home soon. A little while later, he emerged, and Cathy took this picture of him chowing down. Later still, he made his usual appearance at Rose's house, so everyone is relieved and back into their routine again. While I was disappointed that I could not bring him down in a secure way and release him at his home, I was also very pleased that he may have learned a valuable new skill. I just hope he remembers that the next time he finds himself in a tree.